I arrived with my tour group at the Parnaiba River Headwaters National Park many hours after dark, having flown from Rio via Brasilia to a small soya boomtown called Barreiras to transfer to a minibus for a six-hour road trip. The park is in the state of Piaui, which, my host – and expert naturalist – Charlie Munn told me, means 'Beyond nowhere' in the local Amerindian tongue. But on waking the next morning this 'nothing' turned out to be quite something. We were staying at a camp owned by Lourival Lima, a former macaw tracker who, Charlie said, “came over to the good side of the forest” in 1994. Now his considerable skills and savvy are employed searching for animals that visitors can admire. The camp is set in the landscape known in this Brazil as Cerrado. A complex tropical savannah, it is the second-largest biome in South America (after the Amazon) but is among the least studied and least protected. The scrubby land was bone-dry after months without rain but was not bland or dull-looking. Gnarled trees peppered the red earth and every significant depression seemed to be filled with dense bush. Stands of mauritia palms and tabebuia trees add splashes of youthful lime green, yellow and pale pink, and there are tall rust-red cliffs and buttes fringing open areas of gold-coloured grassland. 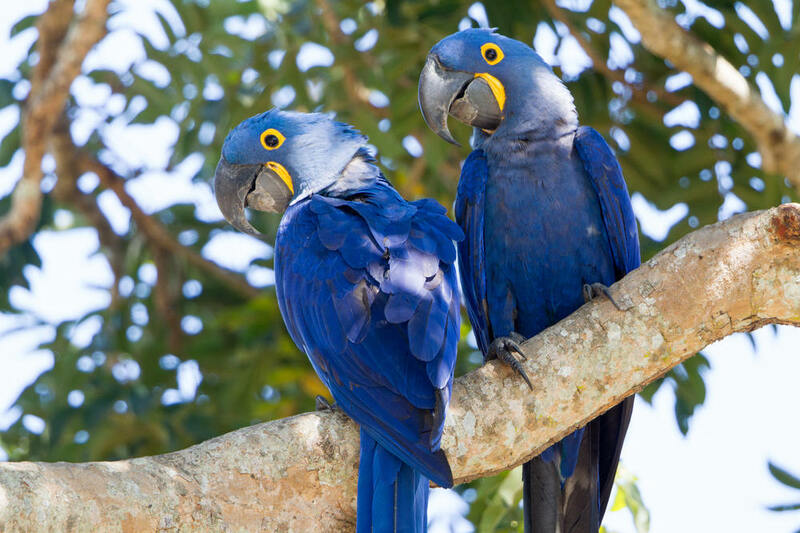 We had travelled here to see the maned wolf, one of Brazil’s Big Five mammals, but before that we were treated to a show by one of the world’s biggest and most beautiful birds: the hyacinth macaw. A metre from top to tail and with a wing span to match, it’s a birdwatcher’s favourite and an emblem of South American conservation. When Lourival was still on the 'bad side' of the forest, he caught these purple-blue beauties and sold them on for export to rich private collectors in Europe, America and Asia. We watched the macaws from a hide as they chattered, played, preened and used their razor-sharp, rock-hard beaks to split open large palm nuts and get to the soft, sweet flesh inside. Charlie said the macaws have fed on these coconut-flavoured fruits since the time of the megafauna: giant sloths would have eaten the nuts, burned off the outer layers with their digestive acids and then excreted the tasty kernel. Now the macaws had to do all the hard work themselves. Gregarious, curious and great fun to watch, the macaws presented a full-blown wildlife spectacle. In the rising sun their feathers were regally hued and their yellow-ringed, protruding eyes flickered against the backdrop of dark green foliage. Little wonder the collectors nearly drove this particular macaw almost to extinction. That same morning I saw a Brazilian cavy and some cute tufted marmosets and perhaps 20 new – for me – species of bird, including a pearl kite, swallow-tailed hummingbird and blue-crowned parakeet. There were also tropical kingbirds, great kiskadees and toco toucans, all of which I’d seen before – though I’ll never take seeing toucans soar across the upper canopy for granted. The Parnaiba River Headwaters park is a long way from the mainstream Brazilian tourist beat (which the Amazon and Pantanal easily dominate), but it rivals some of South America’s best wildlife magnets when it comes to effortless, eclectic birdwatching. Specialists already come, as do wildlife documentary makers. But Charlie says many sites – including one we visited to marvel at bearded capuchin monkeys using stone tools to open palm nuts – get just a few dozen visitors a year. This article was written by Chris Moss from The Daily Telegraph and was legally licensed through the NewsCred publisher network.